The 2018 Papanikolaou Prize took place on the 2nd of November at the Friends Room of the Hellenic Centre in London. The Papanikolaou Prize for 2018 was awarded to Dr Myria Galazi with the paper entitled: “ErbB activation and heterodimerisation is responsible for resistance upon PI3K-mTOR inhibition in metastatic prostate cancer”. See the Abstracts and the rest of the contestants. 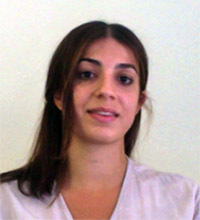 Myria Galazi is a Medical Oncology Trainee in St Bartholomew’s Hospital in London with a special interest in prostate cancer treatment and research. She obtained her undergraduate Medical degree from University College London in 2009 and has undertaken elective work as a final year medical student in Mount Sinai Hospital in New York. Since graduating she has worked in tertiary centres in London and has completed a PhD after being awarded a Clinical Research Fellowship by Cancer Research UK. Her research focused on characterising novel mechanisms of resistance to targeted inhibition in metastatic prostate cancer and has worked on developing exosome-based liquid biopsies for future work as translational tools in clinical trials. During her current post she continues to have an active involvement in Clinical Trials and works closely with researchers in the lab. She has published numerous peer-reviewed articles and book chapters.